Get the most of your workstation with two ultra-high-def monitors. 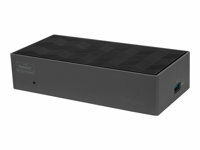 Plug them in with the USB-C Universal DV4K Docking Station with 100W Power, which is Thunderbolt 3 compatible and supports both DisplayPort and HDMI. It'll help keep your laptop, and your productivity, humming all day long as it delivers integrated power and charging for most USB-C laptops up to 100W.With four USB 3.0 ports (including one that's high-powered for charging devices), plus an Audio In/Out port for speakers, mics, or earphones, it's easy to customize your workstation. Truly universal, it's compatible with various operating programs and platforms. And it comes with power tips that work with ASUS, Dell, HP, and Lenovo laptops, among others. It's compact enough to not take up too much desk real estate. This dock combines power with productivity in a compact size.